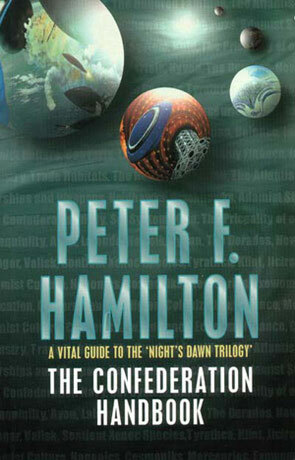 The Confederation Handbook is a stand alone novel set within the same universe as the Nights Dawn Trilogy. "A Vital Guide To the Night’s Dawn Trilogy" the subtitle of The Confederation Handbook says and that pretty much says it all. I read a couple of chapters sequentially, but got a bit bored with that and started hopping around. Both ways worked just fine, except you have to know what you are looking for to be able to find it and there is no index. All the articles that I read where well written and contained lots of interesting facts. Not a must read, not even for rabid fans of the Nights Dawn Trilogy, but a good way to get the final pieces of the puzzle to fall into place. I especially enjoyed the chapters on the Kulu kingdom and the Seldanas. Written on 14th March 2002 by TC.